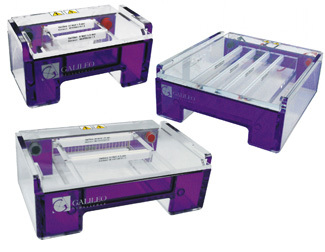 The Galileo line includes horizontal gel systems designed for wide range of applications and gel casting preferences. A large selction of trays, combs and other accessories are also available for all units. Our line includes eight sizes of horizontal electrophoresis devices. Galileo Bioscience is a leader in gel casting technology. These units feature three innovative casting techniques to meet the needs of all research conditions. Follow the link to learn more about Galileo's RapidCast & ExpressCast systems and the complete line of Galileo gel casters. Try High Desert Agarose for high performance and reliability, at a great price. Compare Galileo on price and features, and see why it can be the right choice for your lab.